The new study found that approximately 25.7% of individuals with whiplash injuries also experienced post traumatic stress disorder which adversely influenced their physical symptoms. Prior studies had suggested that PTSD and hypersensitivity to pain could ultimately increase the risk for an individual to develop chronic whiplash symptoms. A study conducted by Ashley Pedler and Michele Sterling of the University of Queensland in Australia was utilized to determine whether individuals with whiplash and hypersensitivity could be categorized according to their symptoms. The study involved 331 patients who had experienced a whiplash injury approximately within 3 months from the automobile accident. Each patient was evaluated for neck pain, disability, cervical range of motion, mental health, and PTSD as well as hypersensitivity. When treating individuals with whiplash-associated disorders, its essential to diagnose the presence of both psychological as well as physical symptoms. 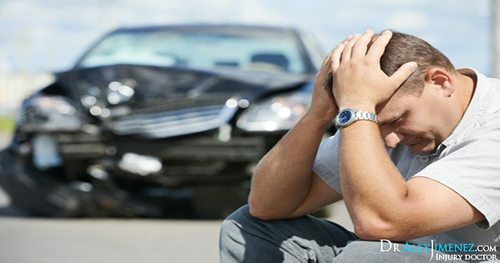 According to research, post traumatic stress disorder, or PTSD, can increase an individual’s chance for developing chronic symptoms after experiencing a whiplash-type injury during an automobile accident. For more information, please feel free to ask Dr. Jimenez or contact us at (915) 850-0900.